Added 11-9-2008 -- Several tile books have been published since Tile Your World was released, but to date, Tile Your World is still the only book in print that completely covers ceramic tile showers. People who have read Ceramic Tile Setting (McGraw-Hill, 1992) will agree that a new book by John P. Bridge has been long overdue. Materials and tile setting techniques have changed considerably during the past decade, and the author's views have undergone a mild revision as well. In his own words: "An old broken down mud man [has been] converted into a cutting-edge, high-tech tile installer." Bridge's association with Schluter Systems L.P. of Plattsburg, N.Y. since early 2002 has had much to do with his transformation. Schluter produces high-tech tile installation "systems." The author attended a training session conducted at the Ceramic Tile Education Foundation in Pendleton, South Carolina, where he became "Schluterized." 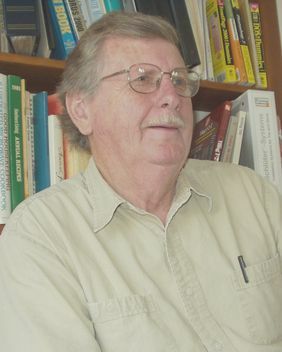 Not long afterward he approached the company's management with the idea of producing a book, the initial production costs of which would be subsidized by Schluter. In return, Bridge would cover the Schluter products he had been so impressed with in South Carolina. Tile Your World is in large part the result of that arrangement. But "mud work," the long-accepted method of installing ceramic and stone tiles over mortar substrates, has not taken a back seat. Bridge takes you through the processes of tiling mortar bed floors, showers and countertops. Other methods are presented for those who feel they aren't up to the challenge. For example, the use of cement backer board is covered in depth. Tile Your World is of value to do-it-yourselfers, to professional tile setters and to those who simply want to gain insight into the various processes associated with ceramic tile setting. It is a comprehensive book that builds on Bridge's thirty years of experience in the business -- a book whose time has truly come, presented in John's "homey" writing style. From Builders Booksource: Although Michael Byrnes' Setting Tile graphics are considerably more sophisticated, John Bridge's book has the kind of depth and breadth of information that we are sold [on]. Given the choice, we'd probably recommend this book over Byrnes unless the photos and graphics were really important to you. An excellent addition to your library in any case. A very dense 230 pages. From Cambium Books: In Bridge's new book, for both amateur and professional tilers, are complete instructions for doing "mud work," the usual method of installing ceramic and stone tiles over mortar substrates. For the more faint of heart, there [are] other methods explained in depth, such as the use of cement backer board. Very complete coverage of the topic, including information on different types of membranes for waterproofing, uncoupling, and anti-fracture; and where and when to use them. Tile kitchen floors, countertops, shower stalls, backsplashes, porches, patios and other projects. From Natural Handyman: If you are looking for a single book that will guide you through all aspects of tile installation and repair, this is it!
. . . this book will get you there with little pain and lots of gain! John Bridge's book does a top notch job of covering a wide variety of tiling specifics and generalities. In addition to all the gory details he has a motivating "can-do" writing style that encourages success. Furthermore, his online website and tiling forums are an amazing resource and clearly demonstrate his willingness to make a major contribution to both professional and do-it-yourself tiling . 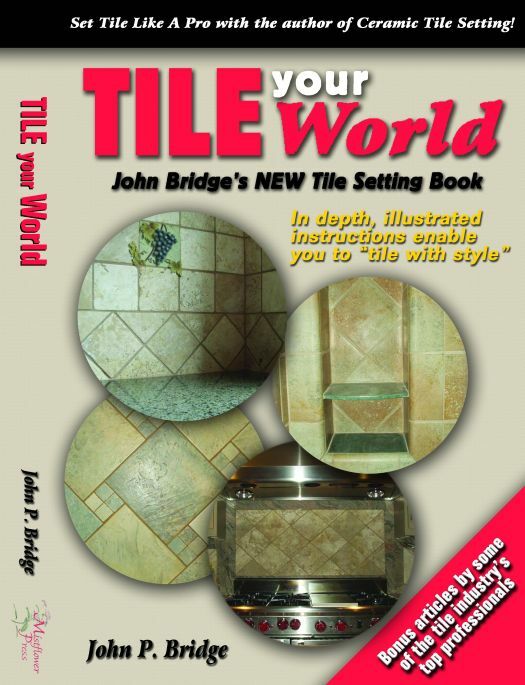 . .
Tile Your World: John Bridge's New Tile Setting Book became available in mid-December, 2003. It is priced at $23.95 U.S. or $31.50 Canada. 248 text pages packed full of tips and instruction. 277 black and white photos and 26 line drawings for a total of over 300 illustrations. 24 full color pages: photos of tiled floors, showers, countertops, patios and porches. Full color photos of mosaic art work by some of the country's foremost artists. Technical articles by top professionals in the tile, building and engineering fields. A revised rendition of John's well-known passage, "Standing Around." Purchase Tile Your World at the Tile Your World Store to receive a signed copy. We are proud to support independent booksellers. When you click the logo below you will discover thousands of books that you can buy at great savings through bookstores near you.